Retail spend on paid search advertising in the UK has risen by 24% year-on-year for the first half of 2016, according to new research. According to Kantar Media company AdGooroo, advertisers spent £26.7 million on the top 250 retail product keywords during the period studied, up from £21.6 million in the same period last year. Amazon.co.uk has led the field in spend, followed by Apple and John Lewis; with brands in the telecoms sector dominating the top 20 retailer list. 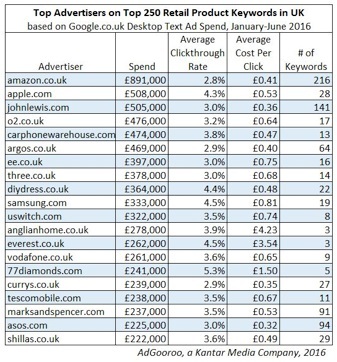 The study examined Google.co.uk desktop text ad activity on the top 250 retail product keywords during the six months up to July 2016. It found that advertisers spent £26.7 million on the keywords examined in the first half of the year, compared with £21.6 million during the same period of 2015. Online giant Amazon.co.uk led the field in spend in the first six months of 2016, followed by Apple and John Lewis. Retailers in the telecoms sector – including o2.co.uk and carphonewarehouse.co.uk – dominated the remainder of the list, making up 6 of the top 20 entries and spending a total of more than £2.2 million. 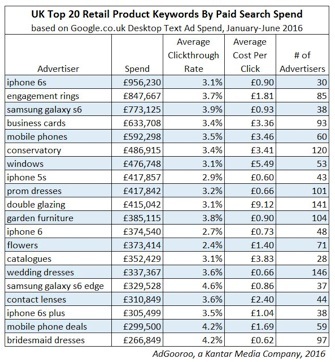 According to AdGooroo’s study, the presence of so many telecoms in the retail ranking is driven by the strength of just 12 mobile-specific terms in the top 250 keywords, which accounted for £4.5 million, or 16.85%, of total paid search ad spend on the keyword group during the first six months of the year. However, apparel & accessories keywords were the dominant category among the top 250 retail product keywords, with 86 apparel terms generating nearly £6.7 million in paid search ad spend during the first six months of 2016, or 25% of the total spend across all 250 terms. AdGooroo examined Google.co.uk desktop Text Ad activity on the top 250 retail product keywords from January 2016 through June 2016.